CarGurus has 4,231 nationwide MX-5 Miata listings starting at $2,495. With an all-new Mazda MX-5 waiting in the wings, the current version rolls into its final year of production with no new updates. According to reports, Mazda plans to unveil a fourth-generation MX-5 in 2014 for the 2015 model year. The new version, developed in conjunction with FIAT and sharing its basic platform and some structural components with the upcoming Alfa Romeo Spider, will feature a sportier exterior design and a SkyActiv powerplant. 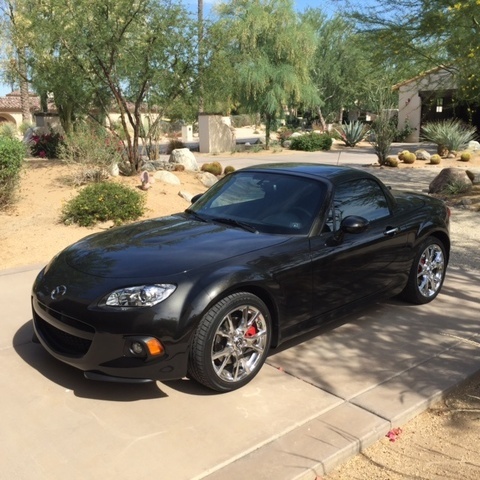 For now, the 2014 version retains the engine, styling and features introduced with the MX-5 Miata's third generation in 2006, as well as the updated features unveiled in 2013, which included a new front mesh grille, a new chin spoiler, revised foglights and a number of new exterior colors. The sport-oriented Club trim, which debuted in 2013, also remains in the lineup for 2014. Although it doesn't receive any updating for 2014, the MX-5 did receive a few positive endorsements. J.D. Power and Associates singled out the MX-5 for the highest initial quality in the Compact Sporty Car segment, an award it's received for 7 of the past 8 years. In addition, Car and Driver named the 2013 MX-5 (exactly the same vehicle as the 2014 version) to its 10Best Cars list for the eighth straight year. Car and Driver noted in particular the MX-5's sporty performance and called it a fun car to drive. It also pointed out the MX-5's continuing status as the most popular 2-seat convertible roadster in the world. Other reviewers have similarly praised the MX-5 for its ideal balance, precise handling, nimble ride and peppy performance. Mazda points out that over its history, the MX-5 Miata has garnered 178 awards. For 2014, Mazda continues to offer the MX-5 Miata in entry-level Sport, mid-level Club and top-level Grand Touring trims. The Sport comes only with a black Z-fold vinyl soft top, while both the Club and Grand Touring trims are available with either a Z-fold cloth soft top or a power-retractable hard top, which opens and closes at the touch of a button in 12 seconds. Mazda offers only a black cloth top on the Club, while owners can order the Grand Touring with either a black or a Spicy Mocha cloth soft top. Although its exterior design now seems somewhat dated, especially when compared to sportier-looking competitors like the Subaru BRZ, Scion FR-S or the surprisingly attractive Nissan 370Z, the MX-5 still displays a clean, sleek appearance, with a rounded nose, a black mesh grille, pronounced wheel wells and a low stance. All MX-5 trims come standard with halogen headlights and foglights, although owners can add optional HID headlights on the Grand Touring trim. Other standard exterior features for all trims include power side mirrors, a glass rear window and chrome-tipped dual exhaust pipes. In addition, a "pedestrian friendly" hood, introduced in 2013, features redesigned hinges at the rear of the hood, which allow it to raise and shift back in the event of a collision with a pedestrian to minimize injuries. The Club trim receives a number of unique exterior features, including a black front air dam, a rear diffuser, black side mirrors, lower side graphics and 17-inch alloy wheels with a gunmetal finish. The Sport trim rides on 16-inch aluminum-alloy wheels, while the Grand Touring gets 17-inch aluminum-alloy wheels. A 2.0-liter 4-cylinder engine with variable valve timing continues to power all MX-5 trims. It generates 167 hp and 140 lb-ft of torque when linked to a 5-speed short-throw manual transmission, which comes standard in the Sport trim, or a 6-speed manual shifter, which comes standard in the Club and Grand Touring trims. Owners can opt for an available 6-speed automatic transmission with paddle shifters for manual gear shifting, available on all trims. However, the automatic reduces hp from the 4-cylinder to 158. Fuel economy numbers check in at 22 mpg city/28 highway with the 5-speed manual shifter and 21/28 with both 6-speed transmissions. The engine drives the Miata through the rear wheels, providing a true sports-car experience. Part of the reason for the MX-5's impressive ride and agile handling remains its high-end suspension, which includes an aluminum-alloy double-wishbone configuration in the front and a multilink suspension in the rear. It's a setup typically reserved for more expensive sports cars, which has helped catapult the MX-5 to the top of its class. For even better handling, owners can opt for an available high-performance suspension system with sport-tuned Bilstein shock absorbers, which provide increased stability and minimal body roll. Rack-and-pinion hydraulic power steering comes standard on all trims, along with vented disc brakes in the front and solid discs in the rear with aluminum brake calipers. While the MX-5 gets good marks for its performance, ride and handling, it has a tight cabin, so it's not an ideal vehicle for long-distance travel. Headroom and hip room remain tight in the two front seats, and cargo space in the trunk measures just 5.3 cubic feet, so it's hard to pack a lot of luggage into the MX-5. In addition, some testers note limited visibility out the back with the top up. On the plus side, the MX-5 comes relatively well-equipped for a compact roadster. Standard features across the line include a leather-wrapped steering wheel with audio controls, a padded center console, air conditioning and power windows and door locks. On all trims, the driver's seat features 6-way manual adjustment, while the passenger seat adjusts 4 ways. Cloth upholstery comes standard in the Sport trim, while the Club trim gets upgraded black cloth seats with red stitching. The Club trim also adds remote keyless entry, a leather-wrapped shift knob and a trip computer, while the Grand Touring includes leather upholstery, heated seats, an auto-dimming rear-view mirror and a leather-wrapped parking brake. For entertainment, a 6-speaker AM/FM audio system with a CD/MP3 player and an auxiliary input jack comes standard in the Sport and Club trims, while the Grand Touring upgrades to a 7-speaker Bose audio system. Bluetooth and a keyless start system are among the options for the Grand Touring, while owners can add SiriusXM satellite radio and a 6-CD changer at all trim levels. Standard safety features include front airbags, side-impact airbags, Dynamic Stability Control, traction control and antilock brakes with electronic brakeforce distribution and brake assist. Some reviewers match the MX-5 with larger sports coupes like the Ford Mustang, Chevy Camaro and Dodge Challenger, but its most direct competitors are the smaller sport coupes and roadsters, particularly the comparably sized MINI Cooper. The Nissan 370Z remains a bigger, badder competitor with more pop and better styling, but it's also several thousand dollars more expensive than the relatively affordable MX-5. Add acceptable gas mileage, and the MX-5 remains a good value for its class. Prospective buyers also might be able to get good deals on the 2014 MX-5, since dealerships will no doubt be clearing out their lots to make room for the upcoming next-generation version. 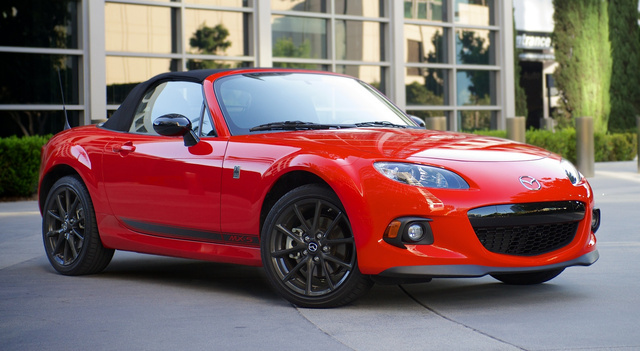 What's your take on the 2014 Mazda MX-5 Miata? Users ranked 2014 Mazda MX-5 Miata against other cars which they drove/owned. Each ranking was based on 9 categories. Here is the summary of top rankings. Have you driven a 2014 Mazda MX-5 Miata?